Movies from the 80s are some of the best in the world. While some are outrageously cheesy, many have become cultural milestones and cinematic legends. What does Hollywood love more than a cinematic legend? Remaking a cinematic legend! I'm here to show you how we can update 10 classic 80s movies for this generation. Except the Princess Bride. That movie is sacred. Follow me under the cut to see how your favorite 80s films will look in 2013! Blade Runner (1982) This classic sci-fi film was hindered by studio meddling and many, many different directors cuts. I feel as if maybe we should hand this over to the Brits. To that end, I propose a remake as a BBC TV show, staring David Tennant as Deckard (he looks good in a trench coat, what can I say?). We can have Stephen Moffat be the showrunner, so it makes just as little sense as the source material and disappoints everyone. 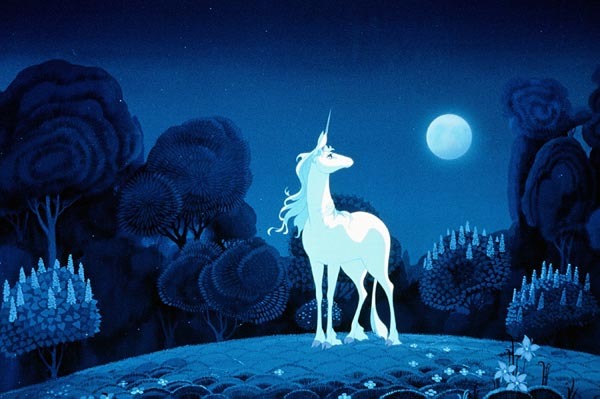 The Last Unicorn (1982) One of the best animated movies of all time (this is NOT up for discussion!) could use a bit of sprucing up for the 21st century. I suggest two ideas: we hand it over to Hayao Miyazaki or Pixar. Miyazaki would give us a lush, beautiful anime version of the film full of stoicism and heart while Pixar would produce a sharp fantasy that tugs on the heartstrings. Update the iconic soundtrack by giving it to an earthy folk-rock band like Mumford & Sons or the Decemberists. Wait, does this make Almalthea a Disney princess? Risky Business (1983) There are various ways this movie can be remade. Move it to England, sprinkle it with technology. I think it should involve Daniel Radcliff. We keep the scene when he's singing in his underwear. For reasons. Allow Wes Anderson to direct it and I think we have a quirky box office smash on our hands! The Hunger (1983) This iconic b-movie about vampires in love starred David Bowie in one of his first acting gigs. While it's hard to top David Bowie's alien level of attractiveness, I think we can try. Cast Tom Hiddleston as Bowie's character and... wait a minute, I think this already exists... oh yeah, it's called Only Lovers Left Alive. Dreams do come true! The Breakfast Club (1985) This 80s teen classic is a coming of age tale about misfits stuck in Saturday detention. It's a little boring for today's audiences though. Inject a little Hunger Games into that story! Instead of sitting around a boring library, detention becomes a battle where only the strong survive. Jennifer Lawerence could play Allison, while we could get Lindsey Lohan to play Claire (we'd kill her first, just for lulz). Throw in a Helmsworth brother (any of them, it doesn't matter which) as John Bender and you're good to go. The principal would off course be played by Woody Harrelson. The Labyrinth (1986) BENEDICT CUMBERBATCH WOULD PLAY DAVID BOWIE'S PART AND THERE WOULD BE MUCH REJOICING ACROSS THE LAND. Top Gun (1986) Fighter pilots? Maybe that was awesome in the 80s, but it's super boring now. Today's audiences wouldn't pay money to see that! Let's make it sci-fi. Instead of fighter jets, they fly space ships! The stakes are higher but the comradery is the same. Michael Bay would have a field day with it. So many explosions. Little Shop of Horrors (1986) Joseph Gordon Levitt would be perfect in a remake of this dark comedy musical about a murderous house plant that craves human flesh. Robert Downey Jr would be the dentist. It would still be campy and hilarious. Maybe we can get Bryan Fuller to direct it. The Brave Little Toaster (1987) This (absolutely terrifying) children's film could also use a good update by our friends at Dreamworks. The Brave Little Toaster? Please. Let's call it The Brave Little iPhone. The iPhone, along with it's friends the Dyson vacuum, the ergonomic Ikea lamp, the little iPod and a Snuggie, go on amazing adventures and discover the true meaning of friendship. And what happens to cars when they're sent to junkyards. That movie still gives me nightmares. When Harry Met Sally (1989) It would still be in New York, but it would feature hipsters instead. Cast Lena Dunham or Jennifer Lawrence as Sally and James Franco or Ryan Gosling as Harry. It would be excessively twee... just like the original. So what do you think of my remakes? What 80s movie would you drag kicking and screaming into 2013? loved your little dig at Stephen Moffat, because i feel the same way. About Bladerunner, about Moffet's writing. Miyazaki would make a fricken incredible The Last Unicorn! better that over to him before he retires for good! Oh, Meghan. I feel a little faint. Remake... Blade Runner with David Tennant? He's cute and all but he could never do the role justice when it comes to the level of steam Ford brought originally. And, and, and The Breakfast Club? I have an emotional investment in this movie and have no rational reason for this but NO! NOPE! NEVER! Could we please get Miyazaki to remake The Last Unicorn?!? The first is amazing but it would be epic if it was done by Miyazaki! Labyrinth remake with Benedict Cumberbatch - YES. TAKE MY MONEY! Last Unicorn remake by Miyazaki - worlds of yes. Cumberbatch as Goblin King... The world would explode from too much awesome. For the good of humanity this must not happen.